No I haven’t taken to hurling footys like cow pies in Wisconsin or wellies in my native Yorkshire. What I have been doing these last few days is adding a couple more pins to my footy world map. I am always excited to be sending one of our kits to some distant land, I wonder about the locations, the scenery in which the finished boat will be sailing in. There is probably a little envy in there too, they get to go places I probably won’t. Notable additions to the list this last month have been K2’s going to Jakarta in Indonesia and Koje City, South Korea. Also, surprisingly, our first kit went to France this week. So there are now little ScaleSailing footy prints in, South Korea, Indonesia, France, Italy, Grenada, New Zealand (north Island), Australia, Ireland, Wales, England, Scotland, Sweden, Belguim, Hawaii, Canada and the USA. This small yacht certainly has worldwide appeal! The first batch of 25 K2’s are almost gone so I am happy to see that the kit is being well received and carrying on the good name of the Kittiwake. The laser is busy cutting the next 50 so there should be an uninterupted supply of Kittiwake K2’s now through until Christmas. Yes don’t forget they make great CHRISTMAS PRESENTS lol… 🙂 Buy early!!! A few days later we were in Traverse City which we found to be a very attractive and interesting place. Traverse City has a very lively main street with good shops and restaurants. Then there is the Mission Peninsula which divides the deeply entrapped Traverse City bay into an east and west half. Mission Peninsula is a very productive wine growing area with numerous vinyards and ‘tastings’ to enjoy. On the west bay side we found the very inviting public slipway pictured above and I couldn’t resist a sail. With Arnold at the helm ‘Holly’ sailed very nicely in the very light flukey wind. In fact I noticed a bit of a drift and with the winds being so light didn’t dare to head out very far into the vastness of the lake. So I stayed close to shore in the crystal clear water while Jan took some photos. You really can’t beat a ‘footy’ size yacht for this sort of thing. Their small size makes them so convenient to travel with. I really enjoy being able to stop when we find a suitable place and there is also the fun of looking for these little public slips to use. Quite often you will discover some beautiful spot which you would have just driven by otherwise. 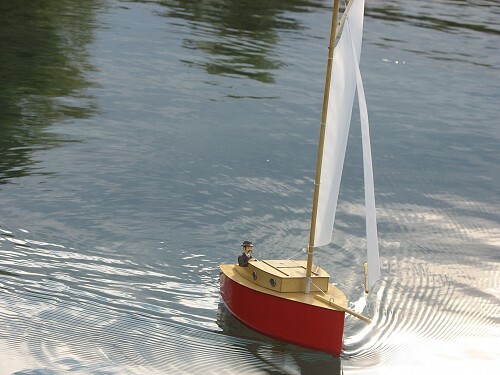 Miniature cruising is just a fun way to add extra interest to any trip you take. We hope you are having fun too.